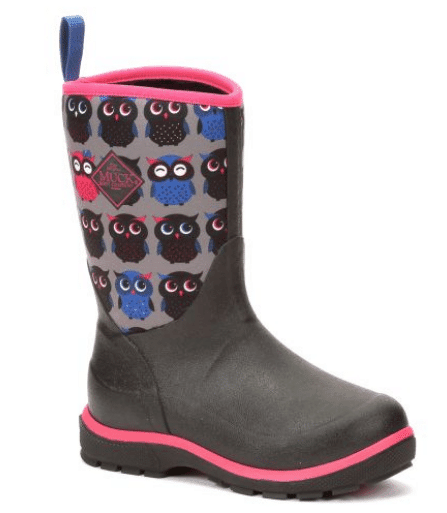 Jan and Jul (also available on Amazon) is waterproof AND fleece-lined so perfect for cold AND wet days. 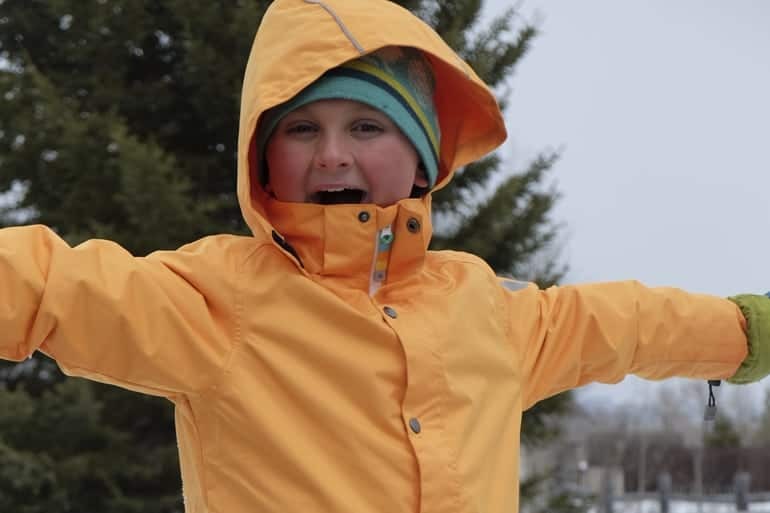 It isn’t bulky, has great hoods and keeps kids warm and dry. 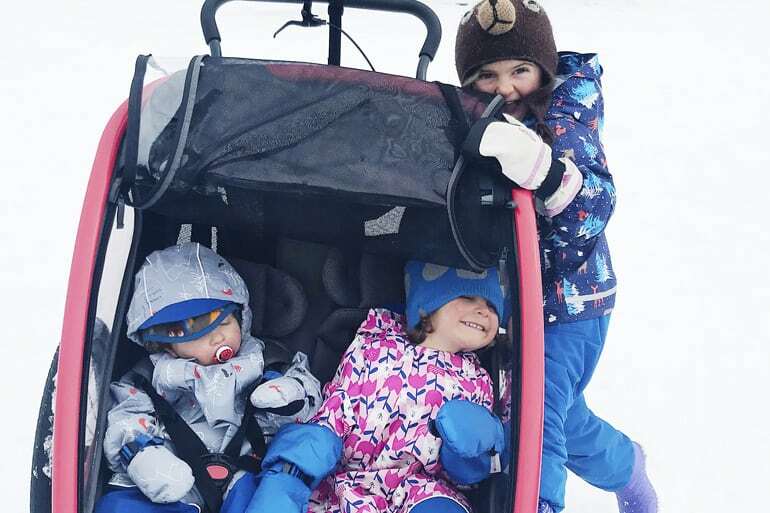 While we haven’t been as impressed with their mittens (many of the toggles have fallen off), we highly recommend their gear. See our full review here. This is the new kid on the block (imported from Europe, thanks to Biddle and Bop) and is a brand new hands-down favorite in our house. I am a kid gear-head dork and I can’t stop gushing about this stuff. 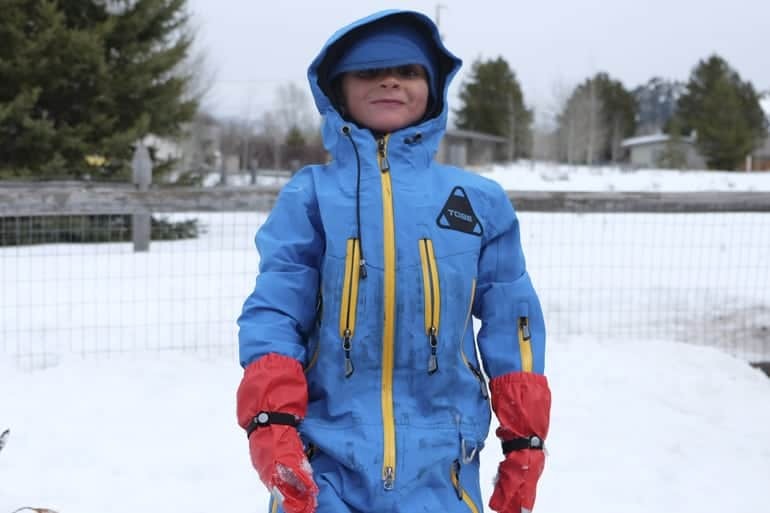 It’s more of what I would call a “hard shell” so is super, incredibly durable, works for snow, slush and rain and is full of tiny details for a great fit. The shell suits and pants/jacket separates are available in stripes and bright solids. The sizing is in Euro so best to measure the child’s height to find the perfect fit. 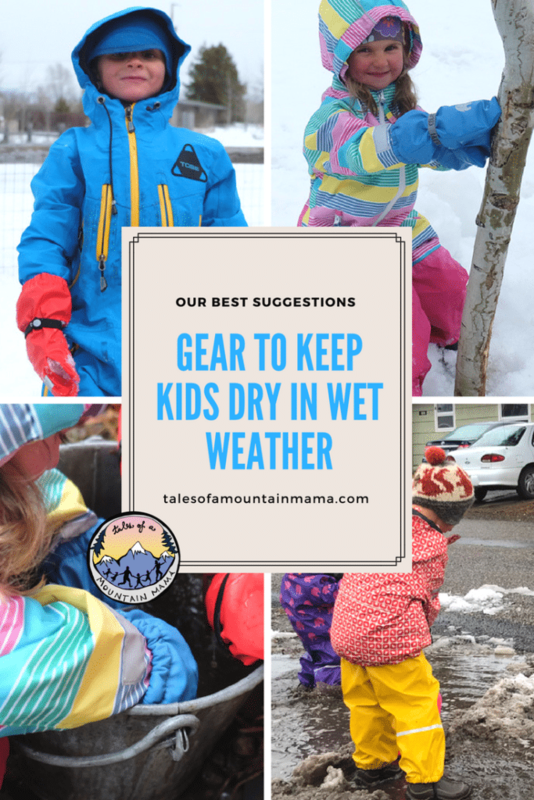 We have used it and loved it in all spring weather conditions (pouring rain, slush, snow, & mud). 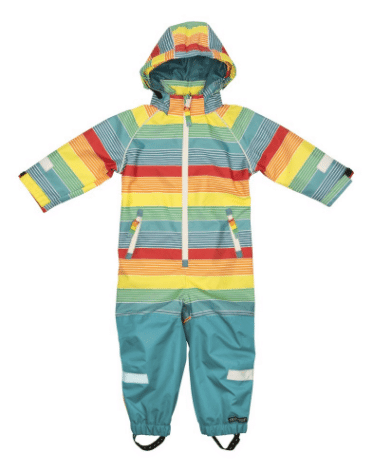 Suits available in ages 2-6 years; Jacket/Pants in sizes 6-9 mo – age 10. Another import, this is one we have been using and wearing for years and years now, thanks to Ollie and Stella. 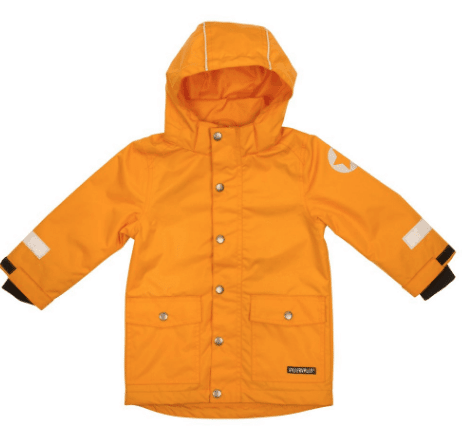 It’s soft and supple for really great rain movement and their hood is THE best I have seen. It’s a lighter weight than the Villervalla so great for warmer temperatures. We have seen occasional tears in our suits (like 2 in 6 years of wearing them), some zipper sticking and eventually they just aren’t waterproof anymore (like after 4 years). But, don’t let those small things turn you away – these are fantastic suits and if you’re just looking for rain, our favorite. 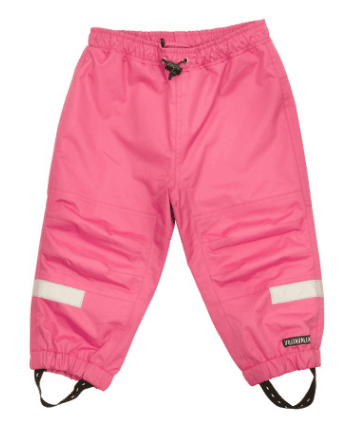 Plus they pack very small and are bright for easy-to-spot kids! 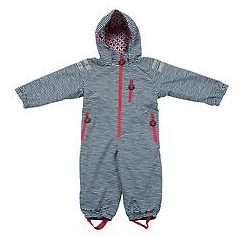 These the most budget-friendly of any of the rain suits you will find and are also fantastic. They are less supple than the DucKsday and more of a hardshell (though not as reinforced as the Villervalla). I love the inside cinchable waist and adjustable cuffs AND ankles. Their downside? The hoods are sort of terrible and don’t keep rain off little faces. These are THE toughest shell out there I have seen for kids. Literally bomb-proof. They are more of a winter shell, but we use in cold, heavy rain too. 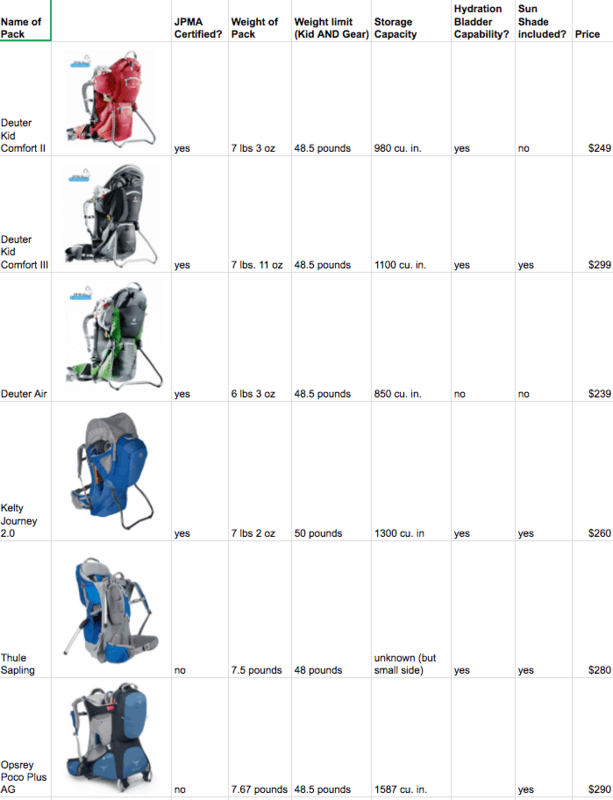 If you need something for all-seasons, especially in colder climates and can afford it, this is what you want! Only downside? I wish there was a bit more shape or a toggle for the waist and that the ankle cuffs were adjustable. The tuffo is the lightest weight and simplest design. 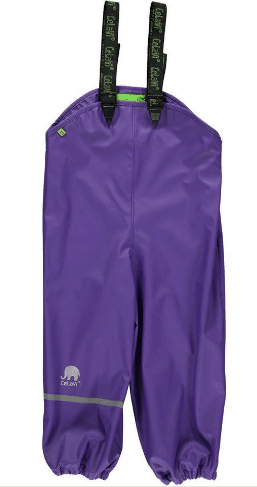 It has double zippers for easy on and off and provides a basic full rain-suit. The cuffs aren’t adjustable and it’s not super thick, but people love love love them and they’re very affordable also. These are a thicker, softer rain jacket and so great for mud because they clean super easily. 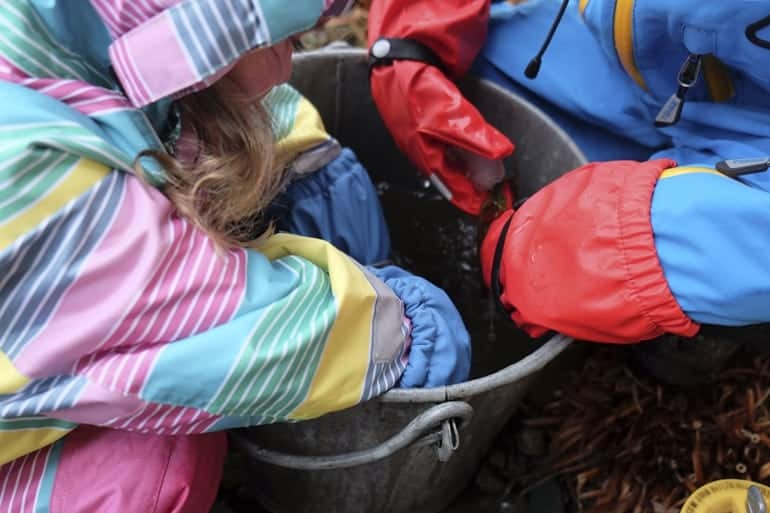 Often in warmer weather, we’ll send the kids out in just bibs. They’re generously sized, but snap at the waist for a more trim fit. Plus, they come in a footed version for babies (who kick off boots anyway!) YAY!! 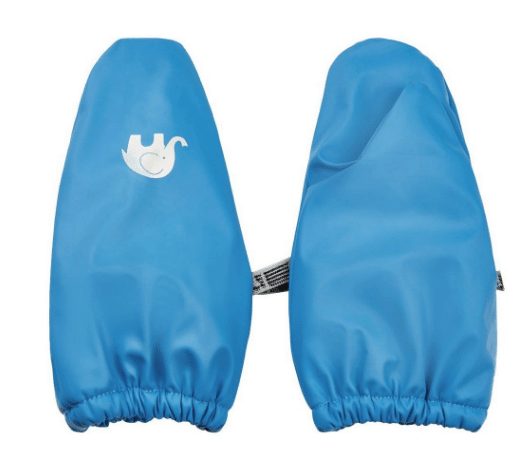 Rain mittens that WORK, where you been for the last 9 years?!?! Intended to be of an overmitten than work by themselves, these are the only ones we have tried that we’ve actually been happy with. 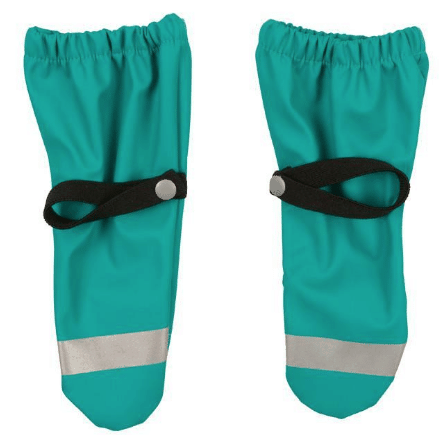 We prefer the ones from CeLaVi with a thin fleece lining (blue), but if you don’t need that and want a little longer length and for bigger kids, go with the ones from Villervalla (turquoise). 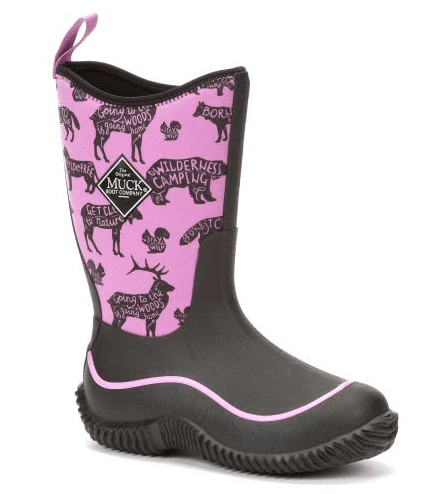 I love these boots, especially for little ones. 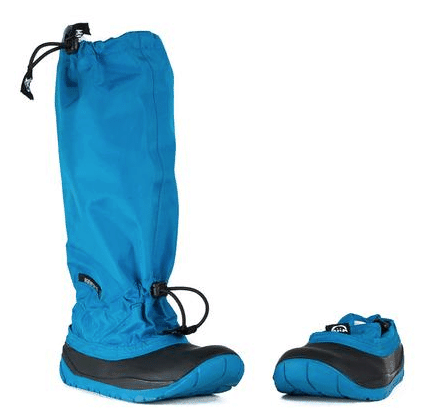 They are super light, packable, waterproof, and help little ones get out and run! Of all the models (Muddy Munchkins and Explorers are the other ones), these are my favorites. 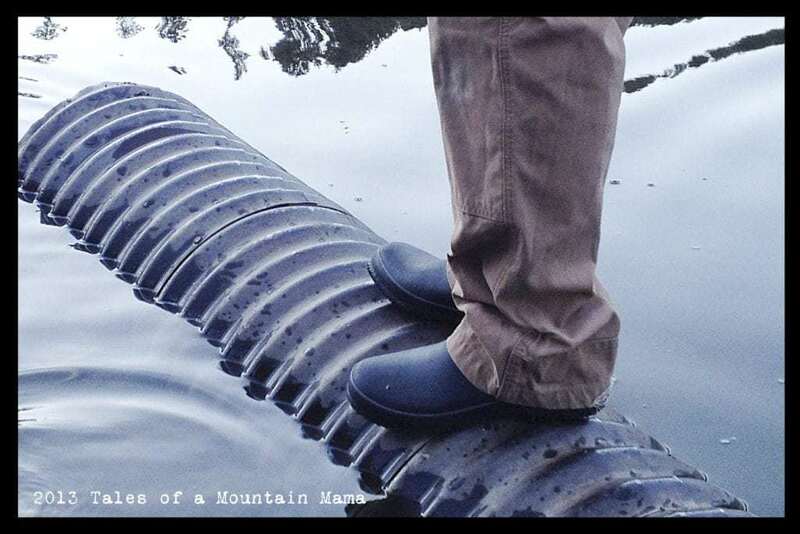 They have excellent traction, stay on and work perfect. Introducing Gear Up for Geocaching – More Gear than August Can Handle! It’s me who e-mailed you about baby boots for spring! I think I’ll go with Muddy Munchkins over Bogs. It seems Muddy Munchkins will stay on better for a crawler but also adapt to a walker as I am hoping to get both spring and summer use out of them and since George is standing and walking behind a little wagon, perhaps walking isn’t too far off? I am now struggling between choosing between a rain suit versus rain bibs and a rain/wind jacket. 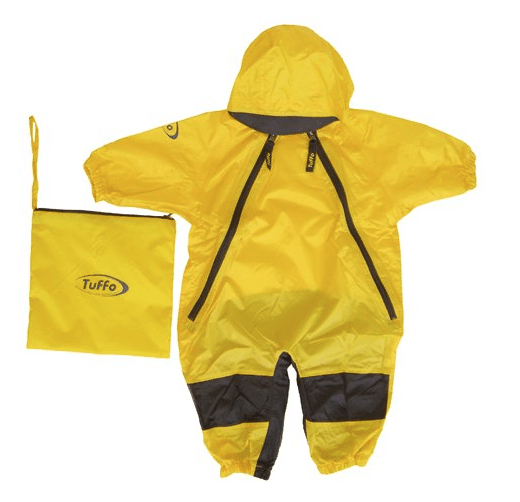 In your experience, is a rain suit more of a pain when changing diapers during camping trips? 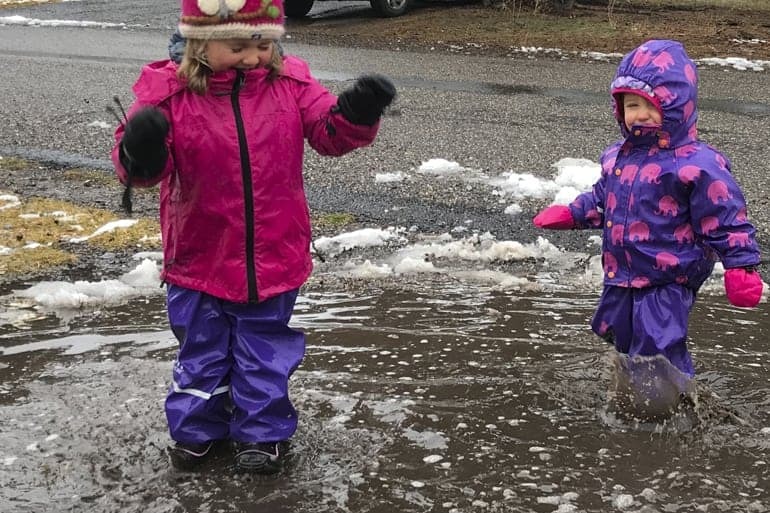 Do you only put your kids in rain suits when it is in fact raining or are they convenient and comfortable enough to wear on cold/windy days for romping around? 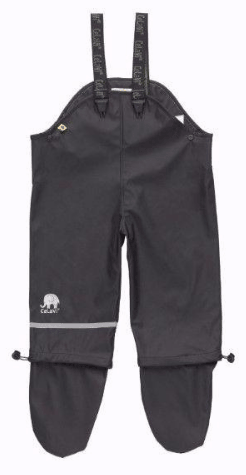 And by rain bibs I mean rain pants haha! 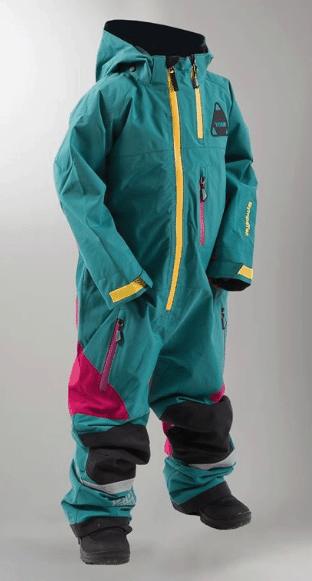 I would go with a suit…we definitely use them for mud/wind/shell layer AND rain/slush/snow. 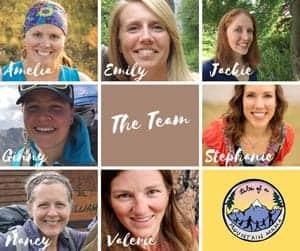 It doesn’t make diaper changes that much harder, because even with bibs you are having to pull off a top layer (and they are so much more protective than regular pants that would allow easier changes). Another question has popped up! My husband is looking at a tent heater. We are wondering if you have ever used one of these and if you think they are necessary and when. We are camping near Lake Superior in May where it could be in the 20’s at night. We have a really small tent… I’m not sure where we would put the thing! Thought we would see what you had to say about them!